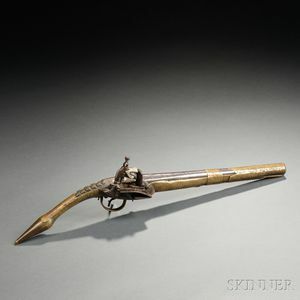 Ottoman-style Rat Tail Miquelete Lock Pistol, c. early 19th century, ornately engraved brass stocks with steel miquelete lock and steel barrel, barrel lg. 12 1/4, overall lg. 20 1/2 in. Some patina on brass and steel parts, frizzen has a little play between bridles.